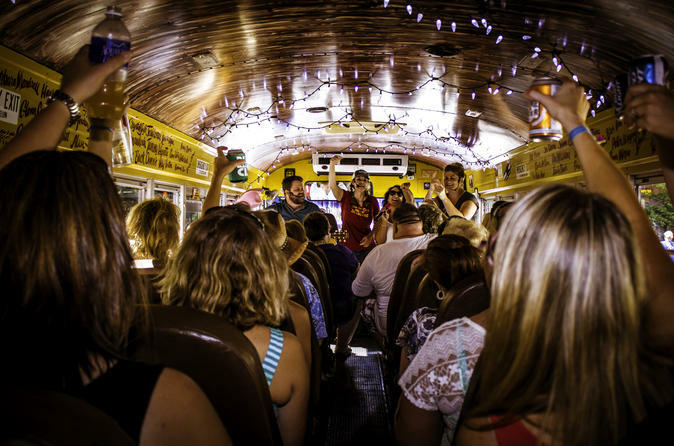 Welcome to Music City's Funniest bus tour and it's ONLY sing-along!!!! This show was just voted the #1 tour in all of Tennessee! You will be riding a bus full of country music, comedy, and you might get lucky enough to be part of meeting an occasional celebrity guest. The girls show everyone a good time and the entertainment is a must! Some Nashville hot spots you will see on the tour are Music Row, Antique Archeology, Historic Honky Tonks, Music City Center, The Ryman and many more. You must be at least 21 years of age as tour contains bawdy adult themes and beer is allowed, but sticks in the mud....need not apply. YOU WILL LOVE THIS SHOW! The Bus departs at 11:30 a.m. and 1:30 p.m.
You will be leaving from Sweet Magnolia located at 330 Commerce Street, next to the CMT building. Please arrive 15-minutes early to claim your seat as this tours leave right on time. The tour typically lasts about 90-minutes and you will be treated to a hilarious journey as you visit some of the Music City’s hottest spots! You will see an award-winning comedy show and country music sing-along showcasing the best of what Music City has to offer – from the past to the present! Nashville Hot spots you will see on the tour will include the Historic Ryman Auditorium, Ernest Tubb Record Shop, Country Music Hall of Fame, The Goo Goo Shop (home of Nashville’s famous Goo Goo Clusters candy), Historic Honky Tonks, Music Row (where all the music is made in the city), and so much more. Come live, love and Laugh your way through Nashville with us! **Please review the rules listed in your voucher.